Let's be real, most OEM gauge clusters are dull looking, especially the S13. Not to mention the OEM sensors are not terribly accurate. 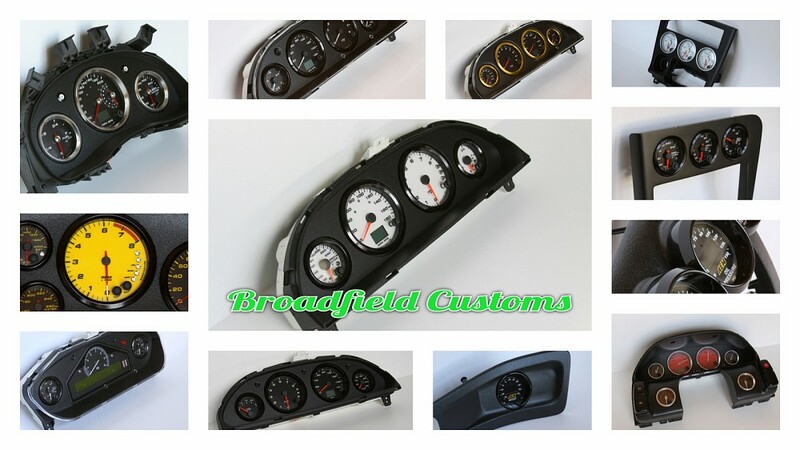 So why not impress your friends and keep an accurate eye on your engine vitals... with a Broadfield Customs cluster or custom interior panel. All pieces are custom made, built-to-order. I do not have pre-made layouts or panels that I use. So your item can look completely different than ones I have previously made. The only gauges I sell are Speedhut. If you want something different then you would need to supply the gauges/electronics. As an authorized dealer, I offer all of the same customization as you see on Speedhut's site and then some. All at a discounted price beyond what they advertise for. The cluster/panel that you want to house the gauges/electronics must be supplied by you. Prices and completion date vary. Please email me with any questions you may have or to get a quote. Last edited by Broadfield; 09-01-2014 at 10:16 PM..
That yellow speedo looks AWESOME !!!! How does it light up? WOW!!! That's some really incredible work you have going on there. Very impressed!